A view of a home which was destroyed during Hurricane Sandy along Fairfield Beach Road in Fairfield, Conn. on Friday November 9, 2012. The past week and a half has been tough on Fairfield Beach Road resident Joanne Landino, though she's trying not to let the strain show. Landino owns three properties on the street, which was one of the hardest hit when Sandy roared through town almost two weeks ago. Though two of the homes sustained only minor damage, the third, a rental, is in bad shape, requiring her to temporarily displace the family that lives there. She said the days since Sandy have been a whirlwind of trying to clean up properties, negotiate with utilities and generally make order out of chaos. "You want life to get back to normal and with that comes stress," Landino said. She isn't alone in feeling a bit overwhelmed. 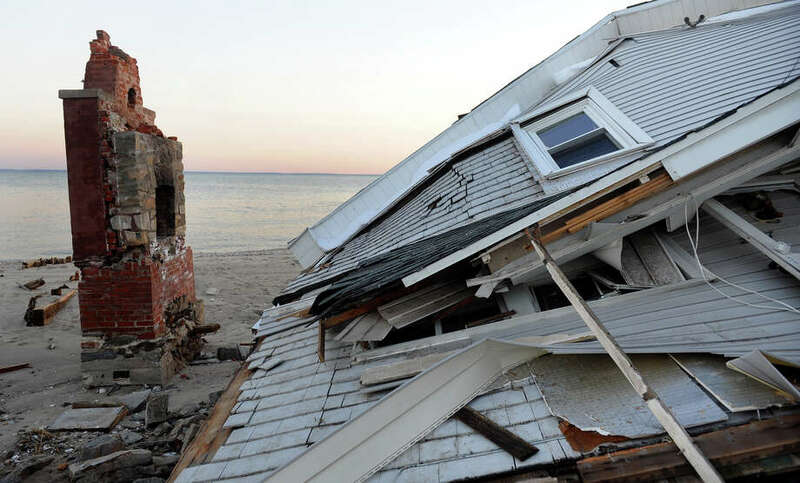 The destruction and high emotion wrought by the one-two punch of Superstorm Sandy and the recent nor'easter has many in the region feeling anxious and stressed, said Sara Victor, a licensed clinical social worker in Westport. She said she has seen an uptick in business lately and attributes it partly to the weather disasters and partly to a general sense of anxiety hanging over modern society. "Everything is harder than it used to be," she said, pointing out that many people are struggling economically or grappling with unemployment. The stress of everyday life "just increases our anxiety about stuff we can't do anything about," Victor said. Thus, when destructive storms like Sandy and the nor'easter hit, they can tip people over the edge. "It's a very difficult thing to have (this destructive event) affect their friends, their neighbors and even themselves," she said. "People are having nightmares. They're have trouble focusing." That's true of people who had property lost or damaged in Sandy, but also of those who just witnessed the storm ripping through their state and leaving suffering in its wake. "It can be very, very upsetting just to watch this happen," Victor said. Kathleen Sanders, program director of mind-body medicine at Stamford Hospital's Center for Integrative Medicine & Wellness, has also seen more people seeking help of late for weather-related stress. "I've seen quite a few people this week dealing with power outages or who have displaced family members living with them," she said. Like Victor, she said that any kind of exposure to traumatic events like Sandy can wreak emotional havoc on some people. Everyone responds differently to stress, but, in general, Sanders said those reeling from a stressful experience "don't really feel like themselves." Both she and Victor said these people might have let many basic health needs slip of late. They're likely not sleeping well or eating the right food or exercising regularly. These may seem trivial, particularly to someone struggling to repair a home or shelter displaced loved ones, but health experts said nutrition, rest and the like are particularly crucial at times like these. A stressed body is a vulnerable body, Sanders said, and those experiencing anxiety and other extreme emotions following a traumatic event may be more likely to have a variety of health problems. These include headaches, stomachaches and spikes in blood pressure. Aside from just taking care of yourself, you can alleviate the burden of stress by seeking comfort from others. "It's really helpful to talk to someone," Victor said, adding that "someone" doesn't have to be a therapist -- just someone you trust. "Spending more time with family and friends can help." Of course, if you're experiencing extreme stress, you probably should consider speaking to a therapist or counselor. "Often, it doesn't have to be a long-term relationship," Victor said. "It can be as long as you need." Landino, also vice president of the Fairfield Beach Residents' Association, said she's holding up well despite everything that has happened, but admitted that just hearing that Sandy was coming made her and others in the neighborhood anxious. "It's always a great concern (when storms come through), and there's not much you can do about it," she said.